Ice cream is so simple yet memory-making. We can all remember some special childhood event that involved ice cream, can’t we? And our kids deserve that, even with food allergies. Though there are several dairy-free ice creams on the market, making my own is less expensive and I’ll just say it…more fun! So I will share more about that! First, having an actual ice cream machine makes life a lot easier. But it doesn’t have to be fancy or expensive. I use this Sunbeam gel ice cream maker (affiliate). It’s been kicking for over 7 years, and I paid under $30 for it. I give it 5 stars for making great ice cream quickly and easily and for saving me loads of money on dairy-free ice cream. Happy Mama right here. Next up, we need a creamy, dairy-free liquid. In our early allergy years, I used Silk soy or coconut coffee creamers, but then I moved onto using canned coconut milk (affiliate). That’s because coconut milk is cheaper, is healthier, and has long shelf life so I can stock up for ice cream anytime I need it. Lastly, you need some quick easy recipes! We have several ice cream and sorbet recipes posted here at Milk Allergy Mom, and here’s one you’ll like. Whisk ingredients together well. Refrigerate for 30 minutes or freeze for 15 minutes before adding to ice cream machine. Add to machine and follow machine instructions. Sprinkles taste great on this subtle tasting ice cream. Hope you get yourself a good little ice cream maker and start making all your ice cream memories soon! 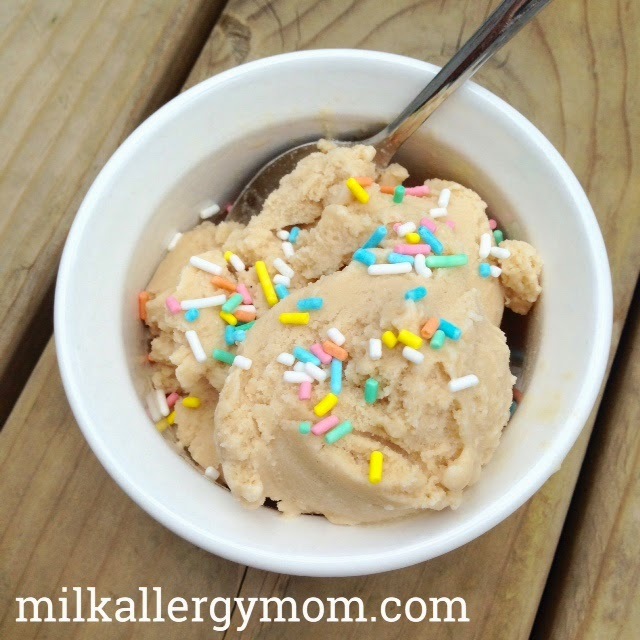 My son has a milk allergy and I have been looking for a good ice cream recipe now that summer is rolling around! Sadly, he is also allergic to coconut- do you use the same measurements when you use soy creamer? Do you prefer to use a flavored creamer? Yes, Mommy! Same measurements. 🙂 Enjoy!